Women hold flares during a march for International Women’s Day in Madrid, Spain, March 8, 2019 (AP photo by Bernat Armangue). 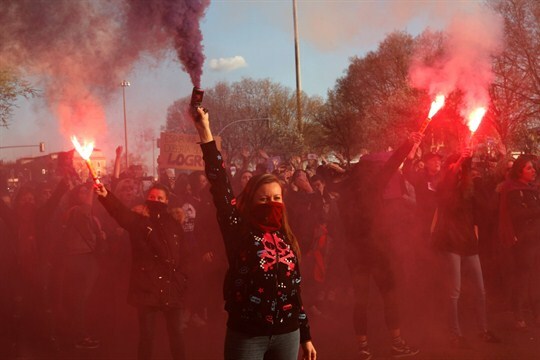 BARCELONA, Spain—For the past two years, millions of women and men across Spain have joined in a general strike and protest to mark International Women’s Day, on March 8, pressing for women’s rights and gender equality. Last year, the sheer scale of the demonstrations was stunning, with an estimated 5.3 million Spaniards participating in workplace walkouts. Now, it looks like they will be a yearly occurrence. Not since the anti-austerity protests of the indignados in 2011, which gave rise to a new political party, the far-left Podemos, have so many Spaniards taken to the streets. With a general election planned for April 28, feminism is at the center of Spain’s fractured political landscape.